As Cambridge officials begin to develop new rules of the road for electric scooters (pictured in Rhode Island) that can be rented with a smartphone app, officials say it will probably be months before they can welcome them back. After banishing electric scooters, Cambridge now wants to bring them back. There’s just one hitch: They’re apparently against state law. As Cambridge officials begin to develop new rules of the road for electric scooters that can be rented with a smartphone app, officials say it will probably be months before they can welcome them back. The reason is a state law that requires powered scooters to include brake lights and turn signals, which most rental scooters do not have. And until they do, city officials said they cannot authorize their return to Cambridge streets. The law was created during the rise of the moped. While the new rental scooters may be more closely related to childhood toys, like mopeds, they have a motor and can propel the machine up to 15 miles per hour. Cambridge transportation director Joe Barr said the state law probably has to change before Cambridge can permit scooters to operate on city streets. But even if lawmakers are willing, they are out of formal session for the remainder of 2018 and almost certainly cannot change the law until next year. The other option could be for the scooter companies to install the required components. While some models from major scooter startups Bird and Lime have brake lights, neither has blinkers. Scott Mullen, Lime’s northeast expansion director, said it would be difficult to retrofit scooters with blinkers — and even if it could, riders would struggle to use the turn signals because one hand powers the machine while the other is positioned for the brake. Chris Cherry, a University of Tennessee professor who studies safety issues with bicycles and new forms of transportation, said blinkers and brake lights probably wouldn’t make scooters any safer because they already travel at relatively slow speeds — a maximum of 15 miles an hour. While scooter safety rules are not a unique problem to Massachusetts, the laws in other states and communities on electric scooters are all over the place. Some cities have set up regulations ahead of any arrivals allowing for their use, while others — such as San Francisco — have banned them until they could establish regulations. Milwaukee banned scooters this year, arguing they run afoul of Wisconsin law requiring safety features. New Jersey law would also appear to ban their use, although Lime offers its scooters in at least two communities in that state. Yet even before the recent craze, the National Highway Safety Transportation Administration argued that motorized scooters that don’t include seats, such as those offered by Lime and Bird, are not subject to federal vehicle standards. Cambridge had sought guidance from state transportation officials over the legality of scooters, Barr said, but was told they could not make such a determination. MassDOT spokeswoman Jacquelyn Goddard said the agency “does not enforce scooter law” and said local police departments could decide whether to crack down. Barr said Cambridge will next work with the city’s State House delegation to push a change in the law, as well as work with nearby cities to develop universal rules for Greater Boston. 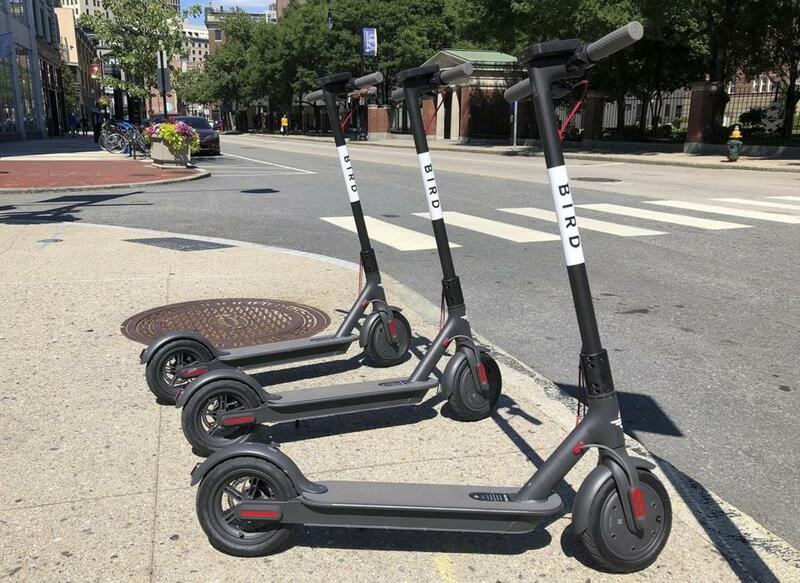 In July and August, officials in Cambridge and Somerville butted heads with Bird after it deployed dozens of scooters without permission. Bird pulled out of the region after the cities began impounding scooters, claiming they violated local rules governing the sidewalks where the scooters were stored. At the time, the two cities said they would consider policies to allow the scooters. Cambridge began that process last week, with a hearing before the city council; in Somerville, officials said they had no update on the process. No scooter company has tried to enter Boston yet. Mayor Martin J. Walsh has said he’s skeptical of the new transportation mode, but the Boston City Council this fall is expected to discuss whether scooters can operate in the city. Bird and Lime representatives attended the hearing in Cambridge last Wednesday, and city councilors indicated they wanted to allow scooters back — but not without new rules that address a range of concerns. Among them: that scooters will endanger pedestrians or clutter sidewalks and other public spaces. Published reports have suggested scooter-related injuries are increasing in cities that allow them, though Lime and Bird argue they are still few and far between and say any new transportation mode would expect to experience injuries among users. Councilors also discussed whether riders must have a driver’s license, which the companies require, and whether Cambridge should establish special lanes for scooters separate from bicycle and vehicle lanes. Officials also noted that they are unsure whether the scooters could operate in winter.